It's no secret that I'm in love with Talde. My friends and family have been made aware that few things get me to drop everything and pretend I like them more than the words "I'll take you to Talde for dinner." Dale Talde is one of the people behind another new Park Slope bar/restaurant, Pork Slope. Cheap beer and good comfort food in Park Slope, that's just shooting fish in a barrel easy. So you when you walk into Pork Slope, you proceed to the end of the bar, where you will be told of some asinine ridiculous wait that makes you hate Brooklyn, you try to make a decision if it's worth it before realizing you can easily sit on a bar stool or a bench by the pool table. The cashier takes your order and money, hands you a number, and then you wait for your food. You may have chosen the Shrimp Po'Boy expecting, I don't know, a po'boy. What you get are jumbo shrimps slathered with the most delicious, perfectly-spiced sauce. The shrimps aren't fried, but that's not what's bothering you. It's the *slabs* of Texas toast these wonderful little specimens of all the sea has to offer are stuck in between. You try to unhinge your jaw like some sort of rattlesnake in order to get a bite in, only to cause major smushing which in turn allows some of your shrimps to break free from their sandwich confines. You hope you've properly positioned your basket to receive the offending shrimp. You will leave full, a little worse for wear, thankful you brought a friend and not someone you're trying to impress, and swearing that next time, you'll be earlier in order to get a table. 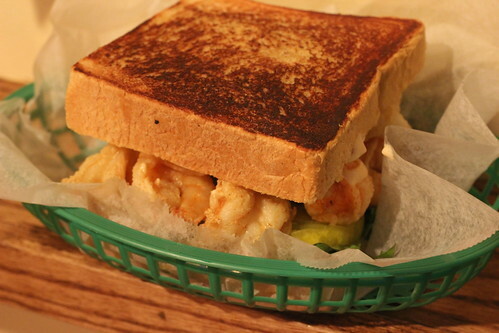 Personally, I'd be really impressed to see someone going for it with a Texas toast shrimp sandwich. This post makes me even more excited to get to Pork Slope, line or not.